Thanks to strong public support and the efforts of the Monmouth County Freeholders and Recreation Commissioners, the Monmouth County Park System now owns and/or manages 17,155 acres at 43 park sites across the county. The Park System's ultimate goal is to preserve over 20,000 acres to meet the county's park, recreation, conservation, and open space needs of the future. Why such an ambitious plan? The Monmouth County Park System has a vision for the future, a vision that includes the continued preservation of land that is regionally significant, as well as the creation of a county-wide open space system. You can help make this vision a reality. If you or someone you know owns land, there may be an opportunity to contribute to the ongoing effort to preserve open space in Monmouth County. Let us tell you about the advantages of helping the Park System achieve its vision-- now and for generations to come. 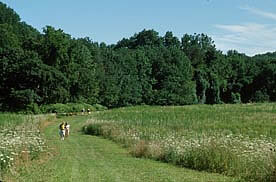 Call the Park System Land Preservation Office at 732-842-4000, ext. 4306 or send an e- mail to Andy Coeyman.